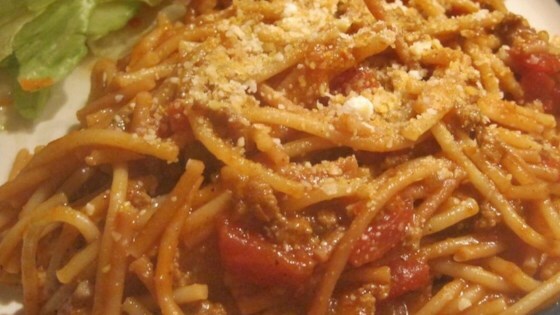 "This fideo recipe was given to me by my mother in-law. It goes great with any meat dish including carne asada. I use this recipe in place of rice as my side dish." Heat oil in a saucepan over medium-high heat. Add the fideo, and fry until browned. Pour in half of the can of tomato sauce, and 1 cup of the water. Season with cumin, garlic salt and chili powder, and stir to blend. Bring to a boil, and cook until the liquid has almost evaporated. Stir in the remaining tomato sauce and water. Cover, and cook over medium heat for about 10 minutes, or until the fideo is tender, and the sauce has thickened. WAY to much chili powder. All you can taste is the chili powder. Cut back to 1 teaspoon or less. It shouldn't be that red in color. This dish is awesome! If you add diced tomatoes with chillies and then some Ranchero cheese on top it is without a doubt five stars! And so easy! So yummy and spicy, I served this as a side dish with empanadas. I am going to make this again as a main dish with corn and pork pieces mixed into it. I thought this recipe was wonderful! This was my first time making fideo... I added a few extra spices as I went along. Very cheap and easy to make!